An expedition to Antarctica is all about the icy waters, sweeping vistas and iconic wildlife (we’re looking at you penguins!). And while there are many opportunities for whale watching, zodiac trips to shore and polar plunges, there are also plenty of ways to keep yourself entertained onboard the ship. 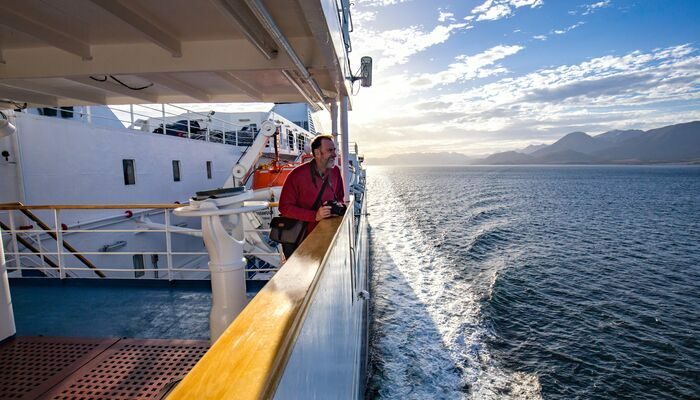 It’s important to keep in mind, that depending on which itinerary and ship you pick, some of the onboard facilities and experiences can vary. However, here are some of our favourites that commonly appear on many of the ships used by Peregrine. Half the joy of a trip to Antarctica is not in what you see, but what you learn about the nature, wildlife and history of this fascinating region. On Peregrine’s voyages you will be joined by a number of industry experts, including marine biologists, naturalists and ornithologists. 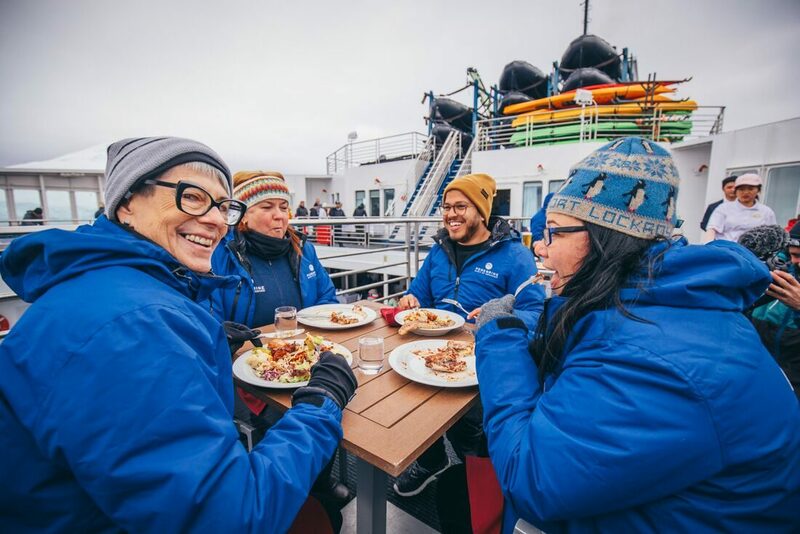 With multiple presentations throughout the voyage and opportunities to chat to the experts over meals and around the ship, you’ll spend more time enthralled by fascinating conversations and less time poring over your guidebook. When it’s cold outside, who doesn’t love to curl up with a good book? And that is exactly what the library on board your ship is for. 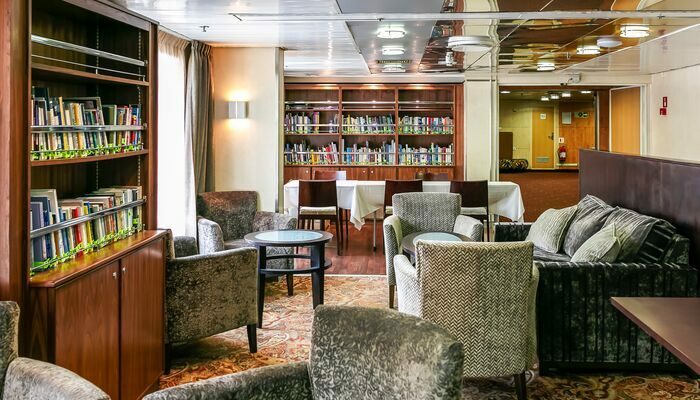 With self-serve coffee and tea and plenty of gripping reads, it’s the perfect place to relax and bond with other bookworms on your trip. Whether you’re a dedicated yogi, or simply someone looking to try a new activity, the yoga and stretching classes are an unmissable experience. Holding a yoga position while riding the swell is a real core workout and a great way to stretch out and get over any travel niggles. While Antarctica isn’t your typical shopping destination, there is something for the shopaholics onboard. Most ships contain a small polar boutique – a place to buy souvenirs for your friends and family back home, or little basic items you might have forgotten to pack. And if you want to venture off the ship? There are many exciting optional activities to partake in on an Antarctic voyage, including kayaking around the perimeter of icebergs, snowshoeing or camping overnight on the peninsula or even taking part in a photography program. All these activities cost extra and must be booked in advance, so it’s worth chatting to your booking agent about them if you’re interested. Do you want to experience the magic of Antarctica for yourself? Book your trip-of-a-lifetime today.